Golden Reef Casino has been online since 2001. This is highly impressive and not something that should be taken lightly. The site has succeeded where so many others have failed, managing to weather the highs and lows of an online gaming market that is still not stable even 13 years later. 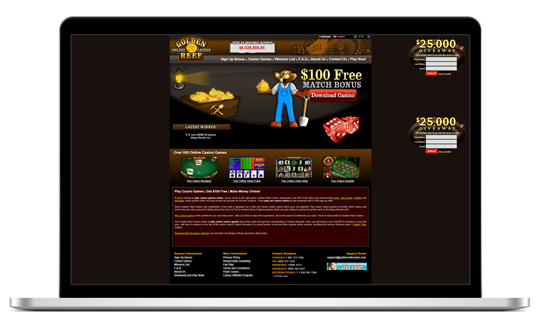 This Microgaming™ site is one that has placed a high value on playability and customer service. This is admirable, and it cannot be emphasized enough that when it comes down to it, the quality of the gaming system matters. whether you are based in England, Ireland, Scotland, Wales or anywhere abroad, you can trust that quality fun awaits you through this trusty online casino. A casino’s theme is normally the LAST thing that I pay any attention to when reviewing a site. That being said, this casino’s name is Golden Reef Casino. I have to admit, when I first went to the main page, I was expecting something involving high stakes fish and other sea creatures. What better use of blinged-out mermaids and high-roller sharks than on a website named Golden Reef? However, my expectations for the theme were not entirely met. The site’s very loose theme seems to be based on mining. The first graphic you are treated to is the image of a cartoon gopher in overalls holding a gold nugget he inevitably dug out of a mine — based on the inclusion of a mine train car and shovel. The only special mentioned on the main site is a £100, 100% match bonus for new players. This means if you have never played Golden Reef Casino, you will be treated to £100 free when you deposit £100. This is a generous match and worth checking out for new players. I’m always hesitant to jump in and play when a site doesn’t mention what they offer their long-time players too. Golden Reef Casino does not advertise any type of VIP or returning player bonus. However, upon reaching out to customer service, I have been assured that the site regularly rewards players who have already deposited. These deals are simply always changing and may vary week to week. Currently, Golden Reef Casino offers over 500 games ranging from flashy Video Slots to classic three-line games and even plenty of non-slot options for those who prefer Video Poker, Table Games like Blackjack and Roulette, and more obscure Card and Parlour Games. All Casino Games can be played for Real Money. There are over a dozen games that feature progressive jackpots, giving players the chance to strike it rich online. Selection is very important, and Golden Reef Casino succeeds in this area. The site is also regularly adding new games. This means even after you’ve experienced all 500 games currently available, and you’re still not done with the fun, Golden Reef is committed to bringing even more options to the site each month. For many players, Golden Reef is like that friendly, local casino that may not be the biggest or flashiest, but it will do what it takes to please the players. At the time of writing, no Mobile Casino App or website is available for play from Golden Reef Casino. You need to download the casino software to get started, but it’s a pretty quick and painless process. Once you’ve chosen your game and entered into the gaming screen, you’ll have nothing to complain about graphics-wise. Golden Reef Casino plays like any other Microgaming™ casino you’ve visited with games that are easy to use and attractive to look at. However, the actual site’s graphics are a bit dated, and the layout is not particularly user-friendly. If you want one piece of advice when visiting Golden Reef, try to ignore the site itself, and concentrate on how much gaming fun is packed into it. There is also a mobile site if you prefer playing on a mobile or tablet. When dealing with Golden Reef Casino and handling your account, you will be pleased to know that there are a number of different methods available for you to do so. Best of all for all United Kingdom residents; it is good to know that out of the four supported currencies, the Great British Pound Sterling is one of them. So whether you live is Ireland Scotland, Wales or England you know your native currency is available and ready for use. With regards to the various methods of depositing and withdrawing, it is good to know that all major eWallet, credit and debit cards are accepted. The customer service and support at Golden Reef Casino is surprisingly helpful. Whether you prefer your help via live chat, phone or email, the staff are friendly and highly responsive. I was also impressed by the high level FAQ provided. It manages to answer many questions that first-time and long-time online gamers may have about getting started as a player on Golden Reef. Based on its current presentation, I give Golden Reef Casino an overall rating of three out of five. The casino has some things going for it that make it appealing to a casual gamer. I like the jackpot presentation on the front page — the live updates are exciting and something a little different. In addition, with 500 Microgaming™ games to choose from, the game selection is more than sufficient for any gamer. If you are willing to look past the flaws in presentation, you’ll find that Golden Reef Casino is a fun site and one with a lot of promise.